If we could rerun the tape of life on Earth, to use a metaphor by Stephen J. Gould, or if we could run the tape for the first time on another habitable planet, what would be the outcome? Would the life forms that evolved be pretty much the same as they are on Earth, or would they be completely different, alien to what we know from Earth? The answer is that we don’t know because we still lack a comprehensive theory of biology. Physicists can readily predict the fate of stars, including that of our sun, but biologists cannot explain why particular life forms (and not others) have evolved on Earth, and they are consequently unable to predict what life will look like on Earth in the future, or what kind of life may have evolved on extrasolar planets. Delineating general evolutionary trends or rules from the rich history of life on Earth is one of the most rewarding exercises for biologists. One such rule is known as the “island rule”. Basically, it states that a species with a large body size will shrink drastically in size when colonizing an island and, conversely, a small species will increase significantly in size. This rule has often led to unique and charismatic island faunas. Mediterranean islands, which are now popular tourist destinations, were once roamed by pony-sized elephants and fox-sized shrews. Unfortunately, endemic island species are particularly vulnerable to environmental disaster and human impact, so it is little wonder that many, if not most, of these bizarre creatures have already become extinct. In her essay Alexandra van der Geer introduces us to this lost world of island dwarfs and giants. The islands of the Mediterranean are well-known for their mild climate, beautiful beaches, traditional villages, and olive-oil laden dishes. For nature lovers there is also plenty of wildlife to admire. Think of the moufflons of Cyprus and Sardinia, the wild boar of Sardinia, the fallow deer of Rhodos, the agrimi or wild goat of Crete, the hedgehog of the Balearics and many more. These are, however, not what one would think. 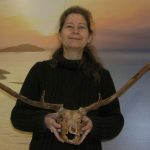 Most of these wild mammals that inhabit the islands of the Mediterranean today were introduced some thousands of years ago by Neolithic farmers, or by the people that came after them such as, for example, the Romans. All of these animals were originally brought in either as food stock that subsequently turned feral, or as game. Today they are, for good reasons, protected as native wildlife and the fact that they are actually introduced species is long forgotten. In fact the native faunas prior to the arrival of humans on these islands were very different. They included pony-sized elephants, pig-sized hippos, dwarf gorals with continuously-growing teeth like those of rodents (Myotragus balearicus of Mallorca), dwarf deer with simplified antlers that are longer than their bodies (Candiacervus of Crete), giant rabbits (Nuralagus rex of Menorca), and giant dormice (Leithaia of Sicily and Malta). These were the days of dwarfs and giants. The smallest elephant that ever roamed the Earth lived on Sicily (Palaeoloxodon falconeri); it had a shoulder height of about one meter and a mere 2-4% of the body mass of its mainland ancestor (Palaeoloxodon antiquus), one of the largest elephants to have roamed the Earth. The smallest hippo on record is from Cyprus (Hippopotamus minor), which had dwarfed to 4% of its ancestral size. 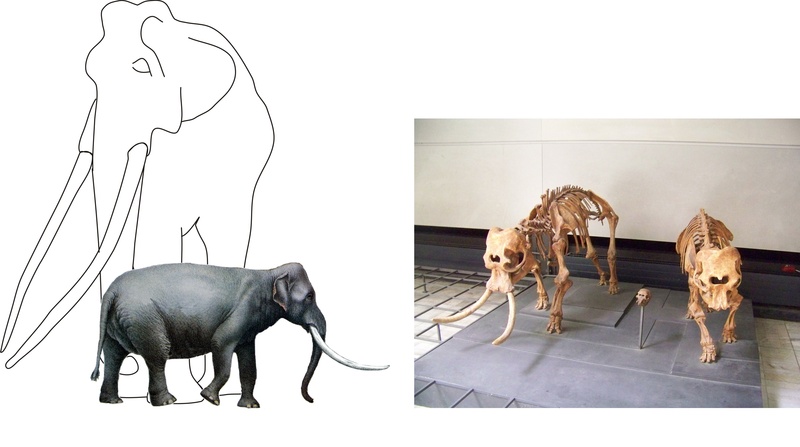 Left: The Sicilian dwarf elephant (Palaeoloxodon falconeri) compared to its mainland ancestor, the straight-tusked elephant (Palaeoloxodon antiquus). The latter, with a body mass of about 8 tons, was one of the largest elephants to have ever existed. The dwarf elephant was, in turn, one of the smallest and weighed slightly less than 200 kg (Image credit: George Lyras). Right: Casts of two P. falconeri specimens on display in the Senckenburg Museum, Germany. The original skeletons are located in Rome University's Museum of Palaeontology. The skull between the two adults (a male and a female) is a cast of a baby skull (Image credit: Wayne Hsieh, flickr). The largest mouse (Kritimys catreus) was native to Crete: it was at least eight times the size of its ancestor and would today be mistaken for a large rat. The giant dormouse of Sicily (Leithia melitensis) was up to almost fourteen times as heavy as its ancestor. The Late Pleistocene dormouse of Malta (Leithaia melitensis) was a giant compared to its ancestor, a form of the common garden dormouse (Eliomys quercinus), and would have been a fierce competitor (After Lomolino MV et al., 2013, Journal of Biogeography 40: 1427-1439). Most of these insular wonders of the Mediterranean are known from the Pleistocene Ice Age, the geological epoch that started some 2.5 million years ago and lasted until the onset of the Holocene, roughly 12,000 years ago. 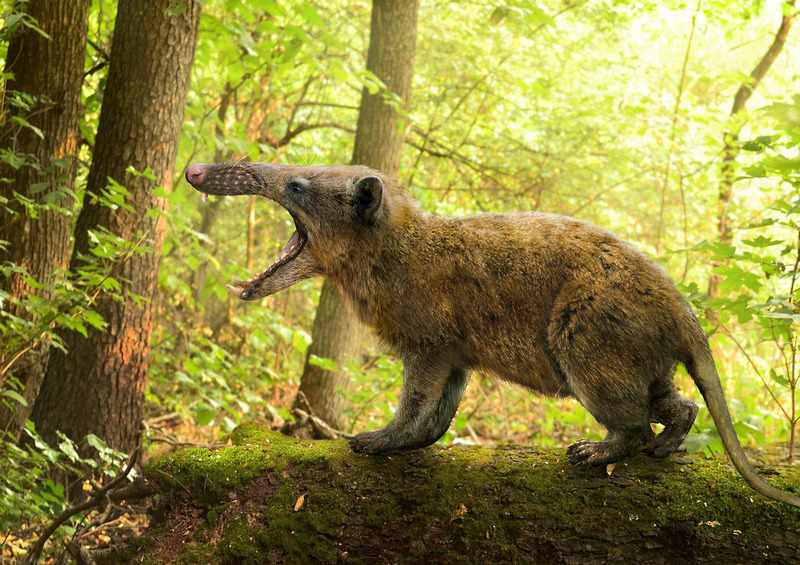 But earlier geological epochs also had their share of marvels such as Hoplitomeryx, an enigmatic ruminant with dagger-like canines and five horns, one of which was on its nose, or the largest insectivore ever, the fox-sized terror shrew (Deinogalerix koenigswaldi). These creatures shared the Late Miocene palaeo-island known as Gargano (now attached to southern Italy) with giant mice, giant hamsters, giant dormice, and flightless giant geese; they were preyed on by giant owls, giant eagles, and crocodiles. The climate on Gargano at that time, some five to eight million years ago, was warm and humid - quite different from today. These dwarfs and giants were the norm, rather than exceptions. Once isolated on an island, large mammal species evolve dwarf sizes and, conversely, small mammal species evolve giant sizes. The pattern is so consistent that ecologists call it a rule, the "island rule", which describes a gradational trend in body size from gigantism in small species to dwarfism in large species. This ecological trend has been observed in vertebrates and invertebrates alike, and is most evident when there are no predators and competitors. The explanation behind this "island rule" is, however, still a matter of debate. A number of different factors are clearly involved and the eventual outcome is dictated by their relative influences and mutual interplay. Food limitation appears to be an obvious factor, especially for the larger mammals: the larger you are, the more you need to eat. Not that resources are necessarily sparse on islands: the original "normal" sized colonizer must obviously have been able to survive. The unpredictability of supply and the lack of any escape route when times turn bad are more likely to have been critical factors. Limited resources also have to be shared with conspecifics, which means that those who need less have an advantage. Another factor might be the age at which animals are able to reproduce: animals that mature at a smaller size and younger age are again the winners. Resource limitation has an indirect effect on small mammals: a larger size means a lower surface area to mass ratio and thus a relatively low heat loss. A larger size thus pays off as it requires relatively little food in relation to body mass. The absence of predators is an essential factor for all sizes. Large mammals such as elephants no longer need to outgrow predators (such as lions and leopards) in order to be safe, and can therefore afford to downsize. Small mammals such as shrews and mice no longer need to hide and seek shelter in order to escape predators such as martens and cats, and can therefore afford to grow to a larger size. Competition, or rather the absence thereof, has perhaps the greatest effect. With no competitors animals are free to occupy new ecological niches that are appropriate for different body sizes and lifestyles. Extinct dwarf and giant animal forms have been unearthed on practically all islands around the world, and the Mediterranean islands are no exception. Dwarf elephants in particular had extremely wide distributions in both time and space. They are known from about thirty islands, ranging from the Californian Channel Islands (Mammuthus exilis) in the west to Timor (Stegodon timorensis) in the east, and occurring from the early Middle Miocene well into the Holocene. They are represented by five genera comprising straight-tusked elephants (Palaeoloxodon), mammoths (Mammuthus), and three types of stegodon (Stegodon, Stegoloxodon, and Stegolophodon). It is hard to imagine today that there was at one time enough forest cover and fresh water to support elephant populations on most of these islands. Elephants are not only generally gigantic, but they are also among the least efficient digesters of the mammal kingdom and need large volumes of water. Nevertheless, they managed to survive on islands. Mice and rats (Muridae) are also abundantly represented, including not only giant forms such as the largest rat ever (Coryphomys musseri of Timor), but also bizarre forms such as the toothless shrew rat (Paucidentomys vermidax of Sulawesi). Other species had far more restricted distributions, directly related to the limited distributions of their ancestral mainland species. Giant hutias (Heptaxodontidae) and spiny rats (Echimyidae), for example, were typical species from the Pleistocene islands of the West Indies, and occured nowhere else. They are closely related to cavies and their kin from South America, the only continent in which these species occur naturally. Water buffaloes on the other hand are typical for southern and southeastern Asia, and dwarf forms are limited to islands such as the Philippines (Bubalus mindorensis, B. cebuensis) and Sulawesi (Bubalus quarlesi, Bubalus depressicornis). 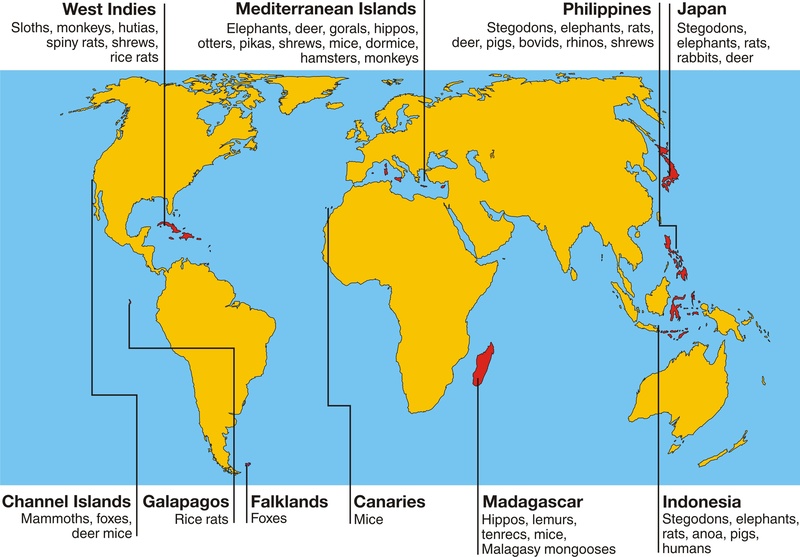 Schematic map showing the islands of the world on which fossils of island dwarfs and giants have been found. The most important species are given, all of which are unique (endemic) to their particular island and most of which are now extinct (Image credit: Alexandra van der Geer). What made it possible for so many fossil species to evolve such extreme body sizes is the time factor. The longer the period of isolation and the less disturbed it was, the greater the opportunity for evolution to achieve extreme results, as demonstrated by the Sicilian dwarf elephant and the Cypriot dwarf hippo at the dwarf end of the "island trend", and by the terror shrew at the giant end. It is easy to imagine that a minimal change in body size in each generation, multiplied by many thousands of generations, eventually leads to an incredibly large change. This is likely to be the reason that murids in particular (rats and mice) are so good at changing their body size on islands. Their generation time is very short - only about half a year at the most (for the slower species) - while that of elephants is very long with a minimum of sixteen years in the wild. To put it in a different way, a thousand years represents at least two thousand generations for mice but at most some sixty generations for elephants. Humans have a tendency to consider themselves somehow different from the other mammals, which is certainly true in many respects but perhaps not when it comes to the "island rule". Humans are, in fact, a large species of mammal and as such would be expected to evolve dwarf sizes on islands, given sufficient time. In 2004 palaeontologists and archaeologists described a diminutive fossil hominin from the Liang Bua cave on the Indonesian island of Flores, about five hundred kilometers east of Java . Its popular nickname “The Hobbit” (after Tolkien’s epic character) was inspired by its small stature of about 1 meter, a weight of about 30 kg, and relatively large feet. The fossils include a partial skeleton with skull and lower jaw, dating back to about 60,000 years ago . The ancestry of this small-bodied hominin is fiercely debated and has been related to modern humans (Homo sapiens, both healthy and diseased), to ancient humans (Homo erectus, Homo habilis), and even to older forms such as Australopithecus. If descended from Homo erectus (the most likely scenario according to most scholars) then the Flores hominin represents an insular dwarf human that developed in a similar way to other large mammalian species. How and when these hominins arrived in Flores remains unknown. They probably came from mainland Southeast Asia via the Philippines and Sulawesi, following the same route as the stegodons and certain rat species. What happened after their arrival is unclear, but remains similar to those from the Liang Bua cave have also been found at the Mata Menge inland site on Flores which is about 700,000 years old, opening up the scenario that the insular dwarfing process had already been completed at this early time . It is interesting to speculate that there may have been interactions between these archaic Flores people and modern humans. New evidence indicates that anatomically modern humans had already reached Australia about 65,000 years ago, which means that they coexisted with the Flores people for thousands of years in the region, albeit perhaps not on the same island. Left: Homo floresiensis is the smallest known hominin; its fossils have been found on the Indonesian island of Flores. The body weight of this dwarf hominin was about 30 kg and it did not stand any taller than about 1 m (Image credit: Histomil.com). Right: Skull of a mature female of the early human species Homo erectus next to that of a mature female of Homo floresiensis. Both skulls are casts of originals: KNM-ER 3733 from Koobi Flora, Kenya and LB-1 from Liang Bua, Flores (Image credit: Alexandra van der Geer). Why have most of these enigmatic island faunas been lost? Why aren’t there any pygmy elephants left, except perhaps on Borneo? What happened to the giant rabbits? In the majority of cases we simply do not know. We can guess that it was a result of the climatic changes following the end of the last Ice Age, when the Earth warmed up, sea levels rose, and environments changed drastically. Some islands may have become too small to provide sufficient food and water, as probably happened on the Cycladic islands of Greece which became fragmented when the large connecting plains were inundated. Other possible explanations involve diseases, or natural disasters such as volcanic eruptions. The latter occurred on Flores, where a volcanic ash layer is found immediately above the layer with dwarf stegodons and dwarf hominins. For a number of islands we have a better explanation: the arrival of modern humans. Humans arrived on most islands around the beginning of the Holocene, the geological period that follows the Ice Age and in which we now live. These early agriculturists hunted the often naive fauna. It is easy to imagine the devastating impact that hunting can have on island species that were maladapted to predators. This was likely to have been the fate of New Zealand's giant flightless moas (Dinornithiformes), which became extinct within the first century following the arrival of humans. Its sole predator, the titanic Haast’s eagle (Harpagornis moorei), disappeared simultaneously. However, worse than direct hunting was the effect of the animals that island settlers took along with them. Consider the iconic dodo (Raphus cucullatus): humans no doubt contributed to their extinction, albeit inadvertently. This was not so much directly through hunting (as originally thought), but rather as an adverse side effect of importing livestock, such as the omnivorous pigs that they took with them, and unwanted hitchhikers such as the rats that ate the eggs and chicks. Introduced diseases and parasites can also be major drivers of extinction. This is well illustrated by Christmas Island's two endemic rat species (Rattus macleari and R. nativitatis), which both succumbed in less than a decade to a trypanosome infection, transferred by fleas from the black rats introduced by humans into the previously uninhabited island. Human-induced ecosystem changes are considered to have been the driver behind the 2007 extinction of the humble Bramble Cay melomys (Melomys rubicola) on an islet in the Great Barrier Reef. The list of recent island extinctions is depressingly long. The further we travel back in time, the more problematic the evidence becomes. Take for example the dwarf elephant of the Greek island of Tilos (Palaeoloxodon tiliensis). This last Mediterranean dwarf elephant may well have continued to exist into the Holocene and protohistoric age, as has been suggested on the basis of a wall painting of a miniature elephant at Thebes, Egypt, in the tomb of Rekhmire, a vizier during the reigns of Thutmosis III and Amenhotep II. The portrayed animal has large tusks, and thus cannot represent a baby African elephant. However, the painting is by no means firm evidence that a now extinct dwarf elephant was presented as a gift to an Egyptian pharaoh in the 15th century BCE. It could equally well be a representation of an African forest elephant (Loxodonta cyclotis), or even be nothing more than the result of a stylistic convention. An argument against its identification as a dwarf elephant from Tilos is that its fossils have not been found in any younger deposits that also contain pottery; in fact, no dwarf elephant fossil has ever been found in a cultural layer. Another problematic case concerns the Cyprus dwarf hippo (Hippopotamus minor). The Aetokremnos site is known for its rich fossil deposit containing many thousands of dwarf hippo bones, apparently in association with lithic artifacts made by Palaeolithic people . Did these Pleistocene hunters indeed drive the ecologically naive hippos to extinction, or did they just form occasional hunting parties, with little impact on the hippo populations? We will probably never know with any certainty. The fossil dwarfs and giants are irretrievably lost, but there are still plenty of surviving island marvels, not only in famous and much-filmed biodiversity hotspots such as the Galápagos Islands and Madagascar, but also on less prestigious islands. Among these are the giant rat of Flores (Papagomys armandvillei), the dwarf deer of Negros and Panay (Rusa alfredi), the hog-nosed shrew-rat (Hyorhinomys stuempkei) of Sulawesi, the giant cloud rat of Luzon (Phloeomys pallidus), the large hutia of Cuba (Capromys pilorides), the day-hunting noctule of the Azores (Nyctalus azoreum), the golden babirusa of Buru (Babyrousa babyrussa), and many, many more. Their survival rests largely in our hands. 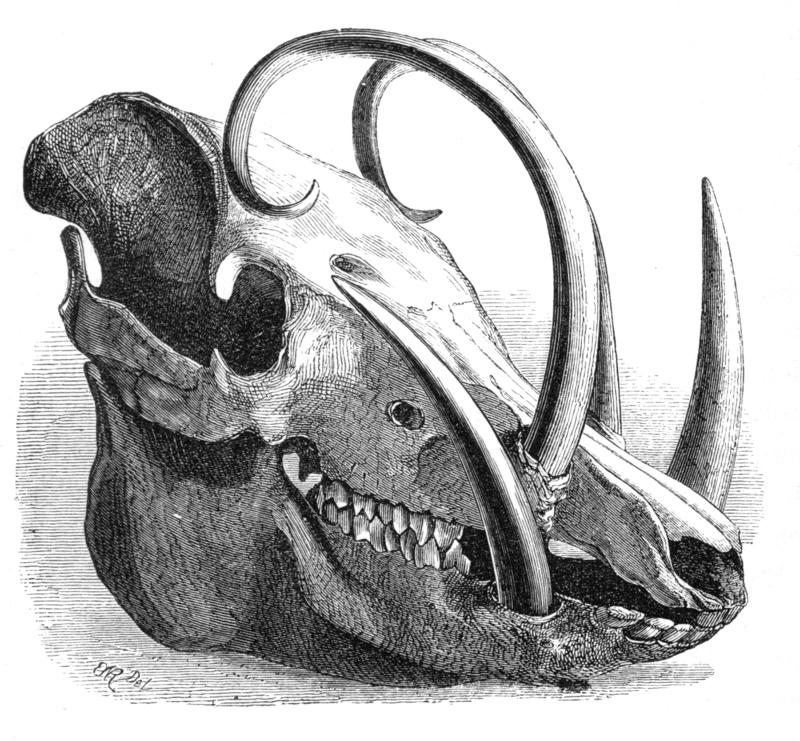 Skull of a babirusa. This enigmatic pig is endemic to four Indonesian islands: Sulawesi, Togian, Sula and Buru. Three species are recognised at present: the golden babirusa of Buru and Sula (Babyrousa babyrussa), the north Sulawesi babirusa (B. celebensis) and the Togian babirusa (B. togeanensis). The most remarkable features are the long upper canines in the male that penetrate the skin and curve backward. Habitat loss and hunting, in combination with a restricted distribution, are unfortunately endangering the future of these insular marvels (Drawing from Alfred Wallace (1869), The Malay Archipelago, London: Harper).